Tattooing traditional, paramedical and Microblading in Washington DC, California and Santa Fe, NM. call 202 805 3365 for your appointment today! please leave a message I work appointment only! Evidence from ancient Egypt, Greenland, Siberia, and New Zealand shows how truly global the tattooer's art is — and how old. In fact, tattooing had existed for thousands of years before England's Captain Cook encountered it in the South Pacific in 1769. Merchant and naval seamen soon spread the art to Europe and America. But while its meaning has varied from people to people and from place to place, tattooing has most often served as a sign of social status, as a mark of one's passage through life, or simply as a way to beautify the body. Once regarded in the West as frightening and repulsive, the tattoo has enjoyed great popularity in our own culture in recent years. Everywhere we look today — movies, advertisements, television-are signs that people of all walks of life appreciate and practice the art of the tattoo. Believe it or not, some scientists say that certain marks on the skin of the Iceman, a mummified human body dating from about 3300 B.C., are tattoos. If that’s true, these markings represent the earliest known evidence of the practice. Tattoos found on Egyptian and Nubian mummies date from about 2000 B.C., and classical authors mention the use of tattoos in connection with Greeks, ancient Germans, Gauls, Thracians and ancient Britons. Tattooing was rediscovered by Europeans when exploration brought them into contact with Polynesians and American Indians. The word tattoo comes from the Tahitian word tattau, which means "to mark," and was first mentioned in explorer James Cook’s records from his 1769 expedition to the South Pacific. Because tattoos were considered so exotic in European and U.S. societies, tattooed Indians and Polynesians drew crowds at circuses and fairs during the 18th and 19th centuries. In October, 1991, a five thousand year old tattooed man made the headlines of newspapers all over the world when his frozen body was discovered on a mountain between Austria and Italy. He had apparently been hunting and was caught in a snowstorm as he tried to return home. Together with the body were clothing, a bow and arrows, a bronze ax and flint for making fire. "I don't like superlatives," said Professor Konrad Spindler of Innsbruck University, but this is the only body of a Bronze Age man found in a glacier, and certainly the best preserved corpse of that period ever found." The skin is of great interest because it bears several tattoos: a cross on the inside of the left knee, six straight lines 15 centimeters long above the kidneys and numerous parallel lines on the ankles. Spindler stated that the position of the tattoo marks suggests that they were probably applied for therapeutic reasons. Instruments that were probably used for tattooing during the Upper Paleolithic (10,000 BC to 38,000 BC) have been discovered at several archaelogical sits in Europe. Typically these instruments consist of a disk made of clay and red ochre together with sharp bone needles that are inserted into holes in the top of the disk. The disk served as a reservoir and source of pigment, and the needles were used to pierce the skin. Clay and stone figures with engraved designs which probably represent tattooing have been found together with such instruments. In 1992, at the very border of Austria and Italy, high up in the Alp Mountains, the body of a man was found, and as they realized that he was more than 5000 years old, they realized they had found a sensation. He had been under ice for all those years, so his body, clothes and equipment was extraordinarily well preserved. He was tattooed! In all 58 tattoos has been counted on his body. His tattoos were only simple dots and little lines. That he was tattooed, was of course not a coincidence. It was probably totally normal for people at his time to be tattooed. Since the tattoos does not represent anything - like animals and the like, speculation has been made as to their meaning. The truth will never be found, but theories and speculations will be made! Just after the Second World War, archeologists excavated the first of a long row of graves in the Altai Mountains of Southern Siberia. These graves had been full of permanently frozen ice, so everything in them was perfectly preserved. Within grave number two, the archeologists found a well preserved chieftain with some fantastic tattoos. These are the oldest known picture-tattoos. The Chieftains Tattoos are representing different totem- and game animals. They are all done in a very distinct style, which is repeated in anything else that they made at the time. When they were carving wood, leather, metalwork, jewelry, felt applications, embroidery, weaving, etc etc. they used saw things in the same way. You may see some of their handicrafts here. This is something that is the same all over the world, and also in other times. People use the same ideas and the same way of expressing themselves in all kinds of media. The Scythians are also very interesting for us in Scandinavia, because some hundred years later the Vikings met with the Scythians. The Vikings traveled up the Russian rivers and met with the Scythians, and the Scythians themselves have been all the way to Europe to plunder and ravage. That way the Scythians' way of seeing things influenced the way the Vikings worked their crafts - and tattoos. 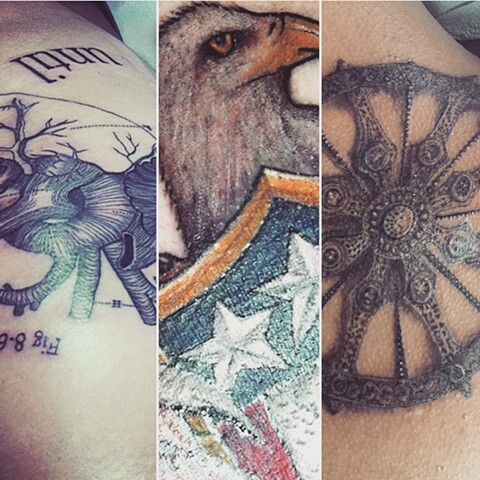 An amazing variety of tattooing methods developed in different cultures. In North and South America, many Indian tribes routinely tattooed the body or the face by simple pricking, and some tribes in California introduced color into scratches. Many tribes of the Arctic and Subarctic, mostly Inuit, and some people in eastern Siberia, made needle punctures through which a thread coated with pigment (usually soot) was drawn underneath the skin. In Polynesia and Micronesia, pigment was pricked into the skin by tapping on a tool shaped like a small rake. Microblading eyebrows first rose to prominence about 25 years ago throughout Asia. Its history is not well-documented in the US, and it doesn’t help that it’s gone by so many different names: microstroking, feather tattooing, eyebrow tattooing, “the Japanese Method,” feathering, hairstroking, embroidery… the list goes on. In Asia, the technique matured as artists experimented with different brow patterns and tools and application techniques.